My previous post included my first e-mail that I sent to Hillsong church. I sent it to their salvation e-mail hotline, prayer@hillsong.com, which you would think would be 911 for lost souls on the brink of hell. Well, it turns out that my first mail, was responded to very promptly with an “out of office auto-reply”. The lights were on but no one was home! I was given another e-mail address to try so I sent it there. This time I didn’t get an out of office auto-reply, instead I got several days of silence. Finally, after several days, Pastor Robert Fergusson wrote an e-mail to me. If you don’t know who he is then let me explain it this way – If Brian Houston were Captain Kirk then Robert Fergusson would be Spock . . . I’m sure that analogy is somehow flawed but I think you get the point. It would seem that my unanswered e-mail had been busy working it’s way up the chain of command and had finally reached the appropriate level of spin doctoring expertise. The material contained in this email may be confidential, and may also be the subject of copyright and/or privileged information. If you are not the intended recipient, any use, disclosure or copying of this document is prohibited. If you have received this document in error, please advise the sender and delete the document. This email communication does not create or vary any contractual relationship between Hillsong and you. Internet communications are not secure and accordingly Hillsong does not accept any legal liability for the contents of this message. Please note that neither Hillsong nor the sender accepts any responsibility for viruses and it is your responsibility to scan the email and any attachments. If only they were as detailed and meticulous about the Gospel of Jesus Christ! What I can say is that Pastor Robert was polite and diplomatic. He assured me of Hillsong’s committment to truth and said that their gospel presentation did contain repentance because the words “change” and “forgive” were used (can someone please tell me where I missed that definition in the Bible?). Furthermore, I can say that Fergusson did not have a single word to say about Hillsong’s editing of Scripture – the case in point being 2 Chronicles 7:14. I guess they didn’t deem that to be of major importance. Clearly, they hold to a different heirarchy of importance than Scripture does! What follows is my second attempt at discussing their version of the gospel and their willingness to selectively edit Bible verses (much akin to using liquid wite-out as a highlighter pen). Fergusson wrote back again, and I’ll talk about that in my next post on Friday. Suffice to say it reminds me a lot of Bill Clinton and the marijuhana he smoked but never inhaled! 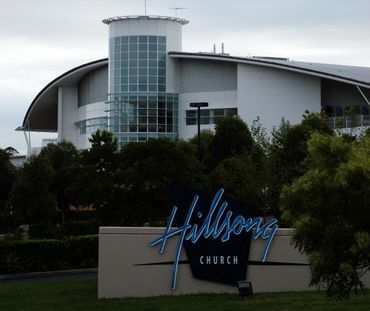 The effects of this false gospel, that Hillsong propogates, are becoming far reaching. What follows here is a tragic video from Hillsong showing how to innoculate children to the true Gospel . . .
You know, this Part 2 opening (not getting any response, slow responses from the “church” ministry team, etc) reminds me of a time when I was in Adelaide (1998/99) and the mega church scene over there. You had to make an appointment to see a “pastor”, and in so doing, you were allocated a certain amount of time, according to the problems/issues that you were experiencing at that time. Of course, you could only be ‘serviced’ by a ‘pastor’ on one day each week… sounds more like a professional setting, rather than a caring sharing church that belongs to the Lord, but then again, if the chief shepherd turns out to be “Pastor D Zaster” then all of the above would make perfect sense. You see folks, those men who were sitting in their little cubicles are more reminiscent of priests hearing confession (it was always YOUR fault, never mind if the ministry or the style of church worship/finances/protection of the ministry team or just idle gossip had gotten the better of you, or caught up with you..
Apart from the chosen day of ‘counselling’, (known by some of its detractors as “confession Wednesday”,) those ‘pastors’ were employed more like cloistered monks, where they still sat in their little cell-like cubicles, doing the paperwork that church clerics have done down through the ages.